By the end of 1997, there were 1,166 Boston Market outlets in 38 states. It took only ten years for the company to reach this number of units—pretty impressive growth. The cinnamon apple side dish has been on the menu since the company opened the doors to its first outlet. The dish from the chain is fairly low in fat—only 4.5 grams of fat per serving—but there is apparently some butter or oil in there. Using the right cooking cooking techniques and some Butter Buds, we can easily take that fat all the way down to zippo, while still getting all of the same great flavors. 2. Peel and core the apples. 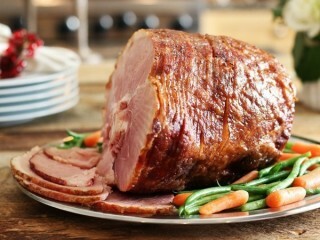 Cut each one into 16 slices and arrange the sliced in an 8x8-inch baking dish. 3. In a small bowl, combine the water with the flour, cornstarch, and Butter Buds and stir until the dry ingredients are dissolved and not lumpy. Add the brown sugar and cinnamon and stir until smooth. 4. Pour the cinnamon mixture over the apple slices, cover the dish with foil, and bake for 40 minutes. Stir the apples every 10 minutes. The automated process for creating Krispy Kreme doughnuts, developed in the 1950's, took the company many years to perfect. When you drive by your local Krispy Kreme store between 5:00 and 11:00 each day (both a.m. and p.m.) and see the "Hot Doughnuts Now" sign lit up, inside the store custom-made stainless steel machines are rolling. Doughnut batter is extruded into little doughnut shapes that ride up and down through a temperature and humidity controlled booth to activate the yeast. 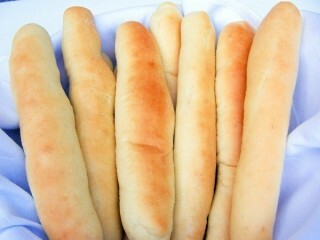 This creates the perfect amount of air in the dough that will yield a tender and fluffy finished product. When the doughnuts are perfectly puffed up, they're gently dumped into a moat of hot vegetable shortening where they float on one side until golden brown, and then the machine flips them over to cook the other side. When the doughnuts finish frying, they ride up a mesh conveyer belt and through a ribbon of white sugar glaze. If you're lucky enough to taste one of these doughnuts just as it comes around the corner from the glazing, you're in for a real treat—the warm circle of sweet doughy goodness practically melts in your mouth. It's this secret process that helped Krispy Kreme become the fastest-growing doughnut chain in the country. As you can guess, the main ingredient in a Krispy Kreme doughnut is wheat flour, but there is also some added gluten, soy flour, malted barley flour, and modified food starch; plus egg yolk, non-fat milk, flavoring, and yeast. I suspect a low-gluten flour, like cake flour, is probably used in the original mix to make the doughnuts tender, and then the manufacturer adds the additional gluten to give the doughnuts the perfect framework for rising. I tested many combinations of cake flour and wheat gluten, but found that the best texture resulted from cake flour combined with all-purpose flour. I also tried adding a little soy flour to the mix, but the soy gave the dough a strange taste and it didn't benefit the texture of the dough in any way. I excluded the malted barley flour and modified food starch from the Krispy Kreme original glazed doughnut recipe since these are difficult ingredients to find. These exclusions didn't seem to matter because the real secret in making these doughnuts look and taste like the original lies primarily in careful handling of the dough. 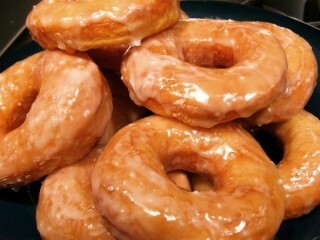 The Krispy Kreme original glazed doughnut recipe dough will be very sticky when first mixed together, and you should be careful not to over mix it or you will build up some tough gluten strands, and that will result in chewy doughnuts. You don't even need to touch the dough until it is finished with the first rising stage. After the dough rises for 30 to 45 minutes it will become easier to handle, but you will still need to flour your hands. 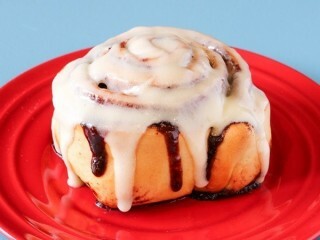 Also, be sure to generously flour the surface you are working on when you gently roll out the dough for cutting. When each doughnut shape is cut from the dough, place it onto a small square of wax paper that has been lightly dusted with flour. Using wax paper will allow you to easily transport the doughnuts (after they rise) from the baking sheet to the hot shortening without deflating the dough. As long as you don't fry them too long—1 minute per side should be enough—you will have tender homemade doughnuts that will satisfy even the biggest Krispy Kreme fanatics. This popular pick from Boston Market may be called a side dish, but it tastes more like dessert. 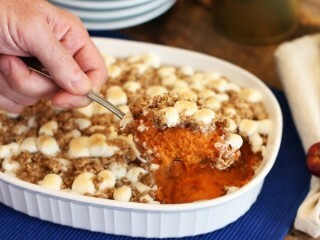 With the brown sugar, cinnamon, and butter in there, and the oatmeal streusel on top, you will be reminded of sweet potato pie; yet the dish goes great alongside meals as varied as low-key chicken dinners or bigger-key holiday banquets. And the great part is, if you're planning to use this for entertaining, you can make everything but the streusel a day ahead so you won't be stressed at crunch time. Just cover the filled baking dish and pop it in the fridge. Take it out a few hours before you plan to bake it so the casserole can come close to room temperature, then you simply top it off with your streusel and pop the whole thing in the oven. The easiest recipes often make the best food, and this simple clone reproduces one of my favorites. 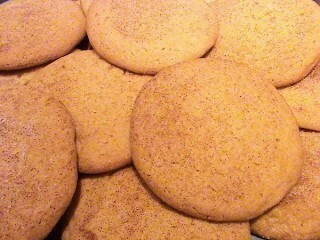 The cinnamon-and-sugar-topped snickerdoodles from Pepperidge Farm's line of soft cookies taste really good and are a perfect chewy consistency—eating just one an excercise in futility. The steps here are pure Baking 101, but don't wander too far from the kitchen when the cookies go in the oven so that they don't overbake. You want to yank the cookies out of the oven when they are just slightly browned and still soft. 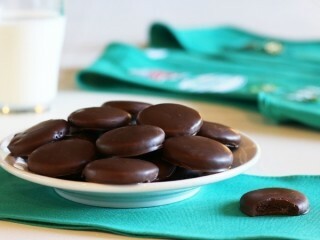 After they cool, store the cookies in an airtight container to keep them soft and chewy. Menu Description: "Grilled Bread Topped with Fresh Chopped Tomato, Red Onion, Garlic, Basil and Olive Oil." In 1972, Oscar and Evelyn Overton moved from Detroit to Los Angeles to build a wholesale bakery that would sell cheesecakes and other high-quality desserts to local restaurants. Business was a booming success, but some restaurants balked at the high prices the bakery was charging for its desserts. So, in 1978, the couple's son David decided to open a restaurant of his own—the first Cheesecake Factory restaurant—in posh Beverly Hills. The restaurant was an immediate success and soon David started an expansion of the concept. Sure, the current total of 20 restaurants doesn't seem like a lot, but his handful of stores earns the chain more than $100 million in business each year. That's more than some chains with four times the number of outlets rake in. Bruschetta is one of the top-selling appetizers at the restaurant chain. 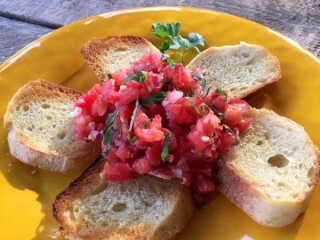 Bruschetta is toasted bread flavored with garlic and olive oil, broiled until crispy, and then arranged around a pile of tomato-basil salad in vinaigrette. This salad is scooped onto the bruschetta, and then you open wide. This version makes five slices just like the dish served at the restaurant, but the recipe can be easily doubled. For many years now, the monocled Mr. Peanut has been Planters nutty pitchman. The character was created in 1916 by a Virginia schoolboy, Anthony Gentile, who won $5 in a contest for drawing a "little peanut person." A commercial artist later added the top hat, cane, and monocle to make Mr. Peanut the stuffy socialite that he is today. But the character has not always been in the limelight. Planters adman Bill McDonough says, "Though Mr. Peanut has always been identified with the brand, over the years he has been dialed up or down to different degrees." In 1999, the company dialed up the polite-and-proper legume to capitalize on nostalgia for the older folks and the young buyers' craving for retro chic. Even though we think of Planters as the "nut company" you won't find a single nut, with or without monocle, in the fat-free version of Planters popular Fiddle Faddle. All you need to whip together this clone is a good low-fat microwave popcorn and a few other common ingredients. This recipe requires your microwave to help coat the popcorn with a thin, crunchy coating of the tasty candy mixture. 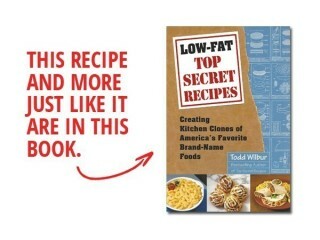 Even though there is a small amount of fat in the recipe, it still comes out to less than 1 gram of fat per serving, so the final product can be called "fat-free." These days just about every casual dining chain has its version of this appetizer: spinach and artichoke hearts mixed with cheese and spices, served up hot with chips or crackers for dipping. Making the rounds over the years, I've tried many of them, and most formulas are nearly identical. That is, except for this one. Houston's makes their spinach dip special by using a blend of sour cream, Monterey Jack cheese and Parmegiano Reggiano—the ultimate Parmesan cheese. 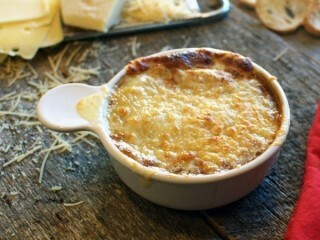 Parmegiano Reggiano is born in Italy and is usually aged nearly twice as long as other, more common Parmesan cheeses. That ingredient makes the big difference in this dip. 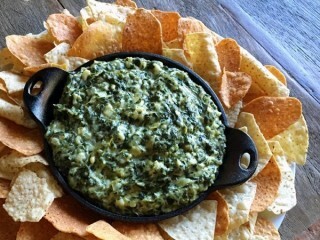 So hunt down some of this special Parm at your well-stocked market or gourmet store, and you'll find out why Houston's spinach dip has been one of the most requested recipe clones here at TSR. Menu Description: "A freshly baked, hot out-of-the oven, rich and delicious cookie topped with 2 scoops of vanilla bean ice cream and served in its own deep dish. Your choice of chocolate chunk, white chocolate macadamia nut, peanut butter or oatmeal raisin walnut." Visit one of the 83 BJ's restaurants located in the West and Southwest and you'll likely find many giddy diners digging down into one of these deep-dish cookie desserts. Even though the restaurant is known for great Chicago-style deep-dish pizzas and a fantastic selection of custom-brewed beers, it's the Pizookie at the end of the meal that gets the most drools. There are four varieties to choose from on the menu, so I'm giving you the BJ's Pizookie recipe for all four below. 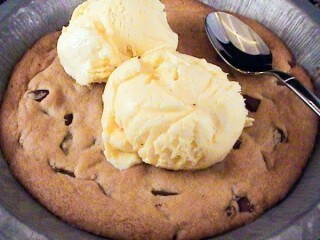 Each formula makes enough dough for one giant cookie, and the Pizookie recipe is so easy that you could make more than one with just a little extra effort. You might think that the cooking temperature of 475 degrees is extreme for a cookie, but since BJ's is a pizza joint, these puppies get cooked in cranked-up pizza ovens, and it works great. Not only will you have your cookie done in only 5 to 7 minutes, but also it'll be nice and brown on top, and slightly gooey in the center—all good things for a cookie, right? The restaurants uses 6-inch deep-dish pizza pans, but you can bake your clones in any cake pan or pie pan with a bottom that is 6 to 7 inches across. 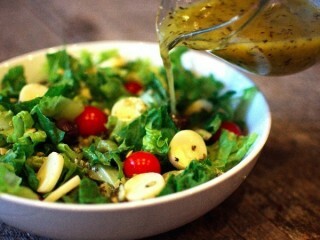 There are a few decent bottled salad dressings out there, but there's nothing on the shelf that compares in taste to this homemade version of the house dressing from Bonefish Grill. Not only that, it's a heck of a lot cheaper to make your own vinaigrette from scratch. 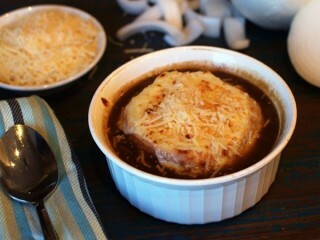 And check out the easy steps: Mix everything together in a bowl, microwave for 1 minute, whisk to emulsify, then chill. If you're a salad lover, this is the clone for you. In the restaurant, these are made with red chili tortillas. Since those can be hard to find, especially in fat-free versions, well use plain flour fat-free tortillas. Except for the color, you can hardly tell the difference. You'll want to prepare several elements of this recipe ahead of time. The relish and slaw is best when made the day before, and the chicken will have to marinate for an hour or so before you grill it. He knows when to hold 'em, he knows when to fold 'em. And lately hes been folding 'em quite a bit as Kenny Rogers Roasters restaurants accross the country have bolted their doors for lack of interest. 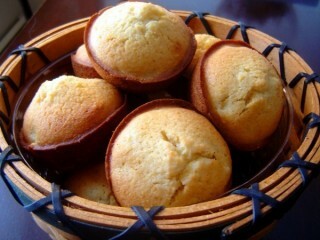 But that doesn't mean that Kenny didn't know how to make awesome corn muffins. And since it's hard to find a Kenny Rogers Roasters outlet these days, the only way to taste these great corn muffins now is to make them for ourselves at home. Here's a technique for making flavorful butternut squash that's crazy easy. Most of your time will be spent cutting the squash into 1-inch cubes so that you can steam it. Use a sharp peeler to remove the tough skin, then skip on over to the chopping block (but please, no skipping with a sharp knife). You can alternately use a microwave to cook the squash whole (see Tidbits), although I prefer the texture from good old-fashioned steaming. 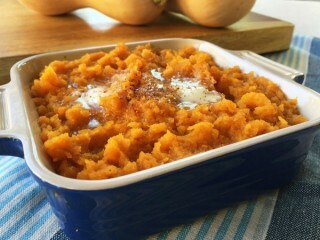 After the squash is cooked, mash it up, mix in the other ingredients, and you've got a great side that fits right in with many meals, especially spicy dishes. Since this squash comes in varying sizes, you may want to start with just 1/4 teaspoon of salt, give it a taste, then add more as needed. 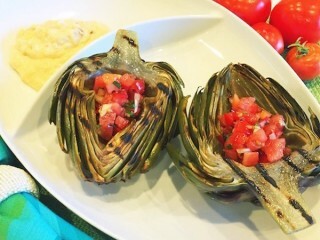 I've been searching for the chain restaurant with the best recipe for roasted artichokes, and I think I've found it. With roasted garlic mayonnaise and a delicious tomato relish on the side, Claim Jumper takes the prize, for now. This recipe is for just one artichoke, but feel free to add another if more than a couple hungry mouths are waiting. Just be sure to double up on the tomato relish. I found the best way to get good cranberry flavor and light pink color into this clone is to use concentrated cranberry juice found in the frozen food section of your market. First thaw the juice, then shake the canister before you open it. After you've measured out the 3 tablespoons of concentrate you'll need for this recipe, make the rest of the concentrate into juice and sip it with your freshly baked bagel clones. The most important step for commercial-quality chewy bagels is no secret: a thorough kneading process. 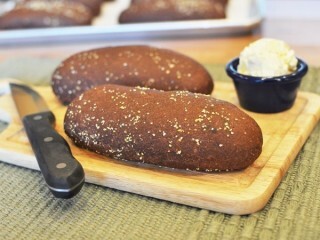 Add flour to your hands if the bagels begin to stick while you form them. 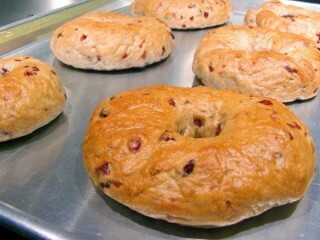 Any excess flour on the bagels will wash of when you drop them in the boiling water. Boiling the bagels before baking is called "kettling," and it's this step that gives bagels their shiny crust. You might not think that a tough World War II flying ace would open a restaurant called "Mimi's," but that's exactly what happened in the 70s. Arthur J. Simms flew spy missions over France during the war and helped liberate a small French town near Versailles. After the war Arthur ran the commissary at MGM studios in Hollywood, stuffing the bellies of big-time celebs like Judy Garland, Clark Gable and Mickey Rooney. He later joined his son Tom in several restaurant ventures including one called "French Quarter" in West Hollywood. This was the prototype for the French-themed Mimi's Cafe. In 1978, the first Mimi's opened in Anaheim, California. 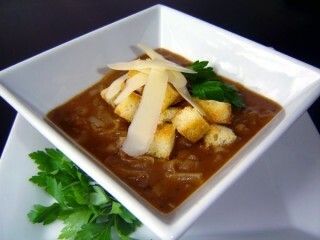 Today there's over 90 Mimi's in the chain with a new one opening every other week; all of them serving this great French onion soup that's topped with not one, not two...three different cheeses. Oui! Exclusive signed copy. Todd Wilbur shares his best kept secrets for making knockoffs of your favorite drinks—right in your own kitchen and without spending a lot of money. 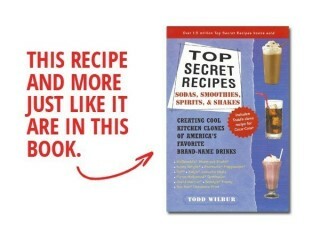 You can re-create the delicious taste of America's most popular brand-name soft drinks, beverages, dessert drinks, mixers, and liqueurs by following Todd's easy, step-by-step instructions. If it comes in a glass, cup, bottle, or mug, it's here for you to clone at home. Discover how to make your own versions of: Nestea, Cinnabon Icescape, Jamba Juice Smoothies, Orange Julius, Red Robin Jamaican Shake, Bailey's Irish Cream, Sonic Drive In Cream Pie Shakes, Dairy Queen Blizzard. Plus dozens of specialty drinks from T.G.I Friday's, Chili's, Hard Rock Cafe, Outback Steakhouse, Applebee's, House of Blues, Olive Garden, Red Lobster, Claim Jumper, and many more from your favorite restaurant chains. 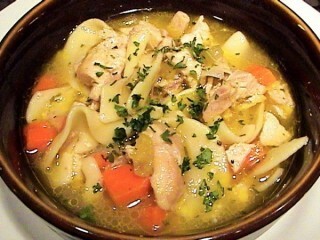 Over 200 popular recipes in all! 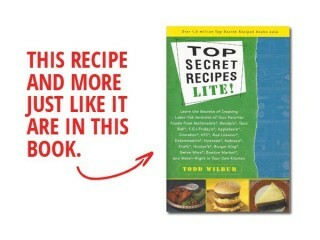 Click on the "Table of Contents" link (underneath the book graphic on the left) to see the full list of recipes in this cookbook. 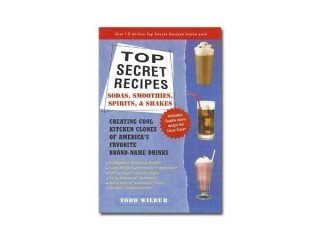 Other books you may like: Even More Top Secret Recipes and Top Secret Restaurant Recipes 3. TSR Step-By-Step and free Hell Flakes! 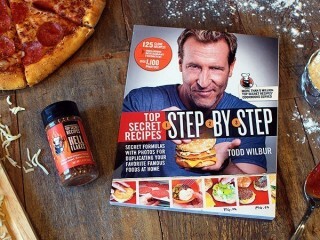 Get a signed copy of the book and free Hell Flakes for a limited time! 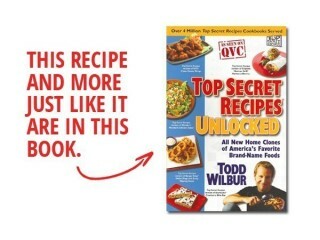 Buy the knockout full-color cookbook from America's Clone Recipe King signed by the author and we'll throw in a free bottle of Hell Flakes, Todd's unique 5-pepper blend. 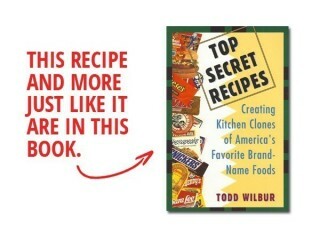 For more than twenty-five years, Todd Wilbur has been obsessed with recreating America's most iconic brand-name foods at home. 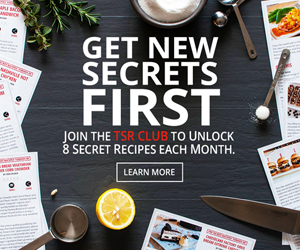 In his first cookbook with color photos, the New York Times bestselling author brings you 125 new clone recipes: 75 first-time hacks and 50 overhauled all-time favorites. 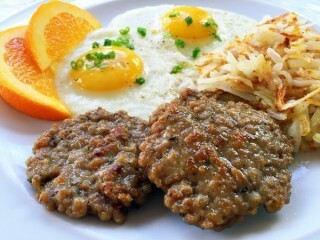 These recipes are not found indivdually on the website with the exception of just a few. 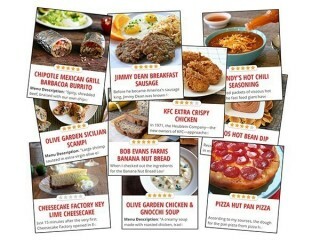 And over 100 more delicious dishes, from snacks and appetizers to entrees and desserts! 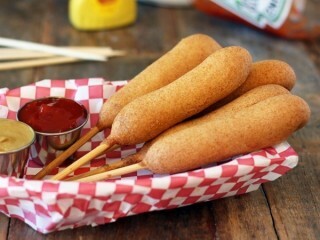 Menu Description: "(Our most popular appetizer.) 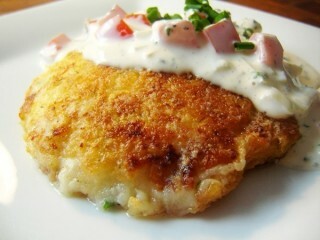 Parmesan, Cheddar & Monterey Jack cheeses, cilantro, onion, fresh dill & mashed potato lightly breaded and fried crispy topped with fresh cut chives. 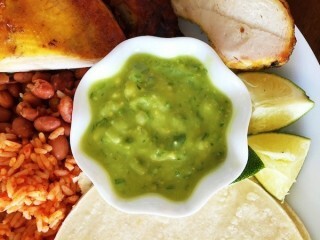 Served with herbed ranch salsa." This top-seller is a versatile side dish alternative to mashed potatoes, but also stands well on it's own as an appetizer. With cilantro, green onion, and three different cheeses in there, the flavor is the bomb. When you add a crispy breading and some herbed ranch salsa drizzled over the top, it's clear why this is the most popular appetizer on the huge Claim Jumper menu. 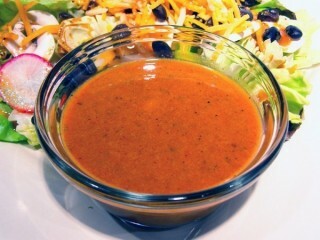 Try dropping a pinch or two of cayenne pepper into the herbed ranch salsa for an extra spicy boost. Got one of those cool hand blenders? It comes in handy for this recipe, which requires the split peas to be smashed into a smooth consistency, just like the original. If you don't have a hand blender, also called a stick blender, a standard blender works just fine. 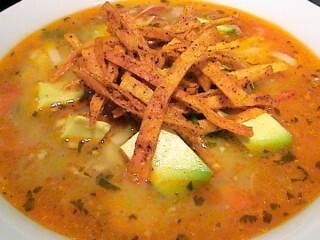 This soup is very tasty and very low in fat. 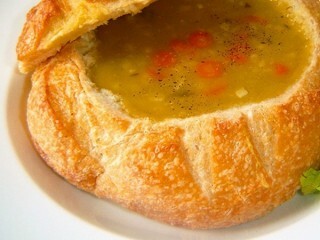 And the barley gives it a special chunky texture and nutty flavor that isn't found in most pea soups. 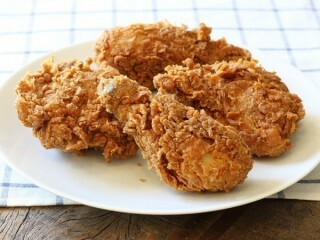 If you like Zaxby's and Raising Cane's Chicken Finger Sauce, you'll love this. 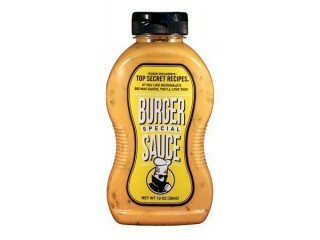 Created by food hacker Todd Wilbur, this sauce is inspired by the delicious secret chicken finger dipping sauce from Raising Cane's and Zaxby's. 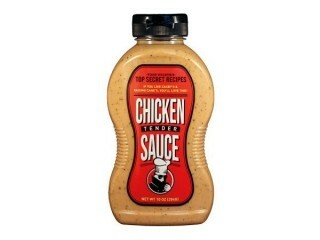 Use it on chicken fingers, fried shrimp and breaded chicken breast sandwiches. Led by CEO Leonard Rawls, the Hardee's Company opened its first hamburger restaurant in 1961 at the corner of Church Street and Falls Road in Rocky Mount, North Carolina. 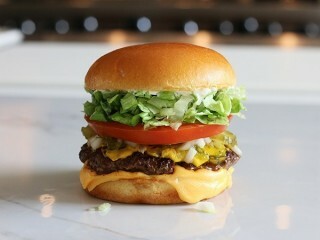 Hardee's has grown steadily through the years, with a number of well-planned acquisitions: first, the purchase of the 200-unit Sandy's chain in 1972, then the buyout of the 650-unit Burger Chef chain in 1983. The company's latest acquisition was the 1990 buyout of the 648 Roy Rogers restaurants. This latest purchase made Hardee's the third largest hamburger chain in the world, just behind McDonald's and Burger King. With that acquisition, the company claimed to be operating close to 3,800 restaurants in forty-one states and nine foreign countries. 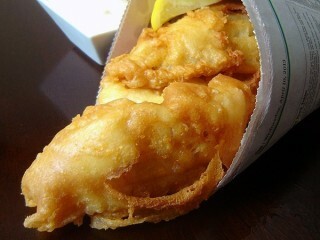 Hardee's was the first major hamburger chain to switch to all-vegetable oil to cook its fried products. One of those products is french fries, the most popular item on the Hardee's menu. 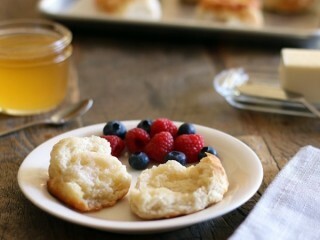 Them's the biscuits at America's most popular stop for breakfast and a copycat McDonald's biscuit recipe is simple to make with Bisquick and buttermilk.